October 22, 2016, 12:01 p.m. Looking around you, you probably wouldn&apos;t expect that three in every four people you see are concealing a criminal past. Yet that&apos;s exactly what is happening, as new research from YouGov can reveal that as many as 74% of British people are ‘micro-criminals’ – having perpetrated at least one very minor (or &apos;micro&apos;) crime. Brits&apos; most commonly committed micro-crime is paying someone cash-in-hand knowing that they won’t pay tax. More than four in ten (43%) of people confessed to YouGov that they had committed this micro-crime. After this, the next most commonly committed micro-crimes were illegally streaming (28%) and downloading (25%) TV shows, movies or music. Unsurprisingly, younger people are far more likely to have done this, with 57% of 18-24 year olds admitting to illegal streaming and 48% admitting to illegal downloading, compared to respectively just 8% and 6% of those over the age of 65. Supermarkets can rest assured that their self-service checkouts aren’t a beacon for criminals. 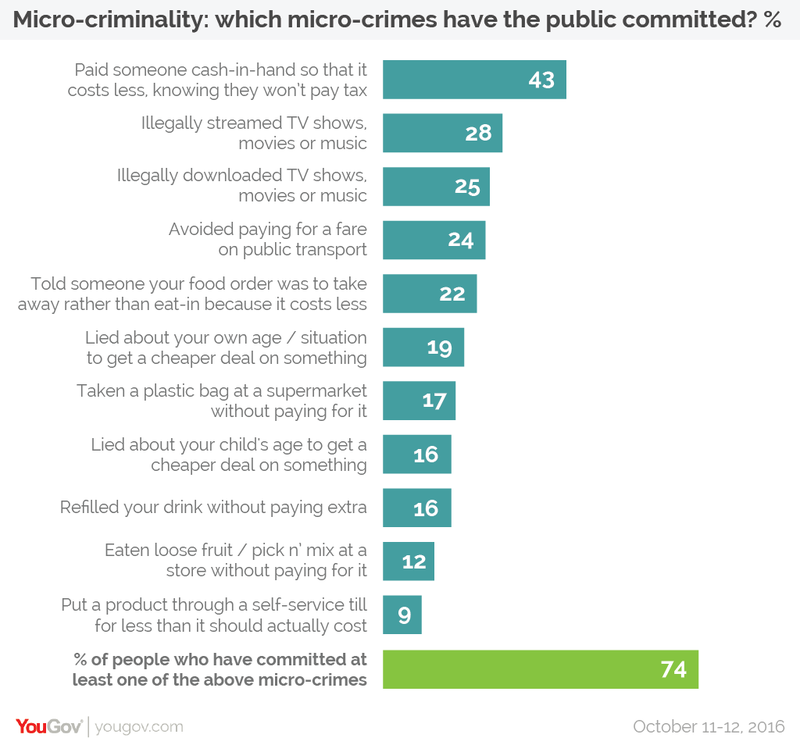 The least commonly committed micro-crime on the list was putting a product through on a self-service till for less than it should actually cost, with just 9% of people admitting to this (and only 1% saying they did it frequently). Of more concern to the supermarkets should be the loss of income on plastic bags, with 17% of people saying that they have taken a plastic bag without paying for it. Assuming that all plastic bags stolen cost 5p each, that frequent thieves (2%) steal one bag a week, occasional thieves (3%) steal one roughly every three weeks, and that those who steal bags once or twice (12%) steal one or two a year, we calculate an annual loss of £4.2m in stolen plastic bags. Whilst the majority of the public are micro-criminals, some groups are more likely to have perpetrated a micro-crime than others. Men, for instance, are more likely to be micro-criminals than women (77% vs 71%), especially in the fields of illegal downloading and illegal streaming. Middle class people are more likely to have committed a micro-crime compared to working class people (78% vs 69%). The micro-crime middle class people are most likely to have committed compared to working class people is paying people cash in hand (47% vs 37%). Despite their advanced age meaning that they have had more opportunity to commit micro-crimes, older people are the least likely to say they have done so. As many as 83% of 18-24 year olds confessed to at least one of the micro-crimes on the survey – this number dropped with each age group until reaching 68% for those aged 65 or older.